Have your ceremony in a beautiful Red Rock setting with a Pink Jeep Tour! A memorable ride to one of Sedona's best sites, get married with a breath taking view surrounding you, and see more of the beautiful vistas offered in the area with a private tour after your ceremony. Pink Jeep Tour for six (6) includes bridal couple, officiant, photographer and 2 guests. Rev. Suzanne Loo-McCoy to officiate your wedding. 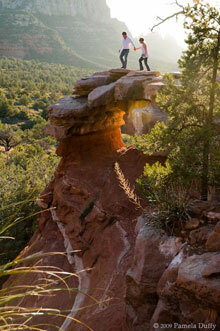 Customized Intimate Sedona Wedding ceremony written especially for you; to include consultation time. Dependent upon your choice of tours, one (1) to 1 1/2 hours of professional wedding photography, with between 100+ to 150+ digital images (dependent on Pink Jeep destination selected below) on a DVD disc or flash drive, with full reproduction rights, that will be mailed directly to you after the ceremony. One beautiful mixed floral bridal bouquet in your choice of colors; to include a lovely ribbon wrapped stem. One matching boutonniere for the groom. Assistance with filing your marriage license after the ceremony. Professional Photographer- to include 100+ digital images. Touring "First Overlook" after the ceremony. Professional Photographer- to include 150+ digital images. Touring Scenic Rim before and after the ceremony.